Taylor Dolman are pleased to have been chosen to provide Guldmann GH3 hoist systems at the new build Abbey Court School Medway near Rochester, where large XY room covering systems are installed in the classrooms with smaller systems in all the hygiene and changing areas. One of the most interesting spaces is the schools Tonto Horse Riding Simulator which provides the students with a realistic riding experience on a professional horse simulator. A Guldmann XY room covering tracking system was installed higher than usual to provide access to everyone. 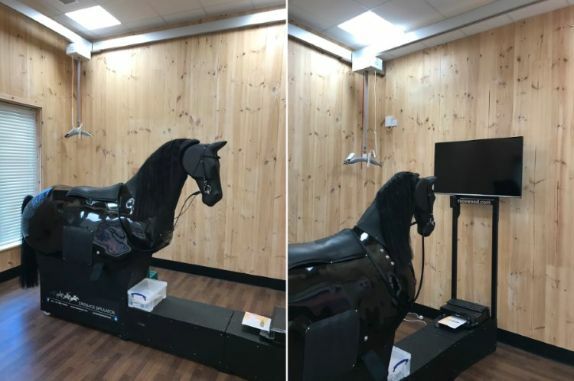 The horse simulator will extend riding opportunities to 80% of pupils, allowing them to engage with the whole riding experience and will help the physical and emotional development of children with special needs. The fully interactive simulator is easy to use for both children and adults. It offers rider’s a revolutionary way to develop their skills and correct their balance. It gives immediate positive and visual feedback on their seat position and control of the horse with the screen displaying the results. Congratulations to everyone involved in creating this exciting experience at Abbey Court School – Medway.